Shauna Lewis in Culture & Arts Drama on 10 February, 2019. 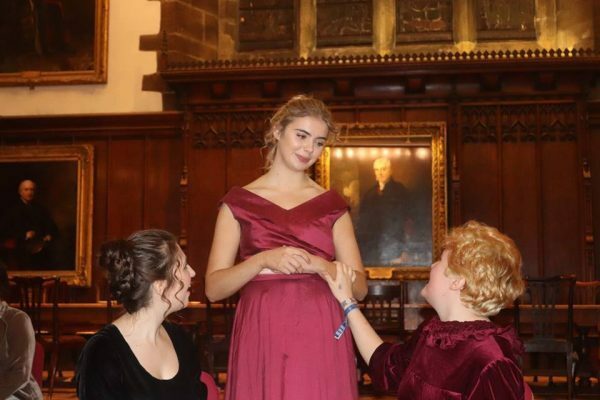 Adapted by Sophie Wright, Jane Austen’s Northanger Abbey is smoothly translated into Castle’s Great Hall (and more places besides). Although the decision to make the play in promenade means it is slightly more tiring to watch than an average play, it works wonderfully as we are moved from ballroom to carriage to Northanger Abbey and back again. As a whole, it makes the play much smoother, and immersive as well, with the world of Northanger Abbey being constructed around us. Aided by the script, the characters of the novel are encapsulated in their entirety. Its dialogue, whilst it could have been quick and alienating to some audience members, is digestible, and makes the play all the better for it. With exception perhaps to the tapestry room segment, which feels slightly more monotonous that the rest of the play, it contains all the fun and drama an Austen adaptation should have. Sometimes the friendship between Eleanor Tilney and Catherine feels more fleshed out than Catherine’s relationship with Henry Tilney, but as is the nature of Austen’s novels, the romance is squeezed into one chapter toward the end. All of the other characters are well-established within their roles, and it is just a shame that we are only able to see some of them in the first act. Helena Baker as Catherine encapsulates her earnest and enthusiastic, yet slightly naïve personality. Opposite her, Ben Cartwright makes for an equally charming Henry Tilney. Even if their relationship towards the end does feel rushed, they manage to make their limited scenes together build up their dynamic, and make the relationship feel as realistic as it can be. Undoubtedly the audience favourite, Ryan Yao-Smith’s John gains a laugh every time he walks on stage, and his delivery nails the overly-serious nature of the character without it becoming melodramatic. As Eleanor Tilney, Lisa Prescott moves between nervousness with her father and her personality when he isn’t there. It makes for a subtly nuanced performance, and although one of the most understated, one of the standouts. As a whole, the dynamic of the cast is easy to see, as they quickly cover up first-night mishaps and make them part of the show. There is an element of self-awareness in the direction of the play, as Catherine and John sit on a basket imitating a carriage. The play has established a fun tone by this point, so it doesn’t feel out of place for them to bounce about on a wicker-basket. As we move into the tapestry room, the carriage scene offers a welcome break from the heavy dialogue, as we diverge into Catherine’s imagination for a while. Here, the lighting is used aptly to convey different moments, and helps change the scene to a slightly Gothic atmosphere (even if it is satirical). Northanger Abbey is on at 8pm, Sunday 10th February, in Castle’s Great Hall.